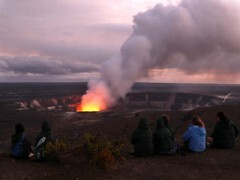 Enjoy a relax Hawaii tour to visit Volcanoes national park from Oahu, Hilo, and Kona. Visit the active volcanoes by taking the epic Volcanoes lava tours or visit Thomas Jaggar Museum. Book now transportation and hotels included. Volcanoes National Park showcases Hawaii’s interesting geological history. Near the town of Hilo, Mt. Kilauea, and the Thurston Lava Tube, the park boasts an incredible, dynamic landscape that is often reshaped by local volcanic activity. Fun tour, could have been better with English speaking guides. Very punctual and coverage was good based on timings. Cool vacation lots of fun. Almost covered the whole Hawaii country. Thanks.